Lets see how easy it really is. First, you have to get the package. It is not in my Ubuntu-Version, but Ubuntu Quantal will have args4j. The package is called libargs4j-java. If you can't install it this way, you have to download args4j. Currently, it is args4j-2.0.21.jar. 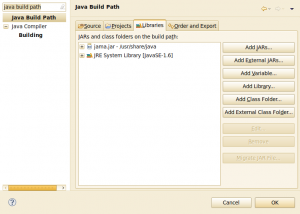 Type "java build path" in the input field at the upper left corner of the window. Now you have to click on "Add External Jar" and add the args4j.jar file. As always in Java, you add another class for parsing your command line values. I've called it CommandLineValues.java and it does only check for the command line argument -i FILE or --input FILE. * This class handles the programs arguments. * @return true if no error occurred. * Returns the source file. * @return The source file. Note: How can I prevent Eclipse from adding the 'final' for certain lines of Java code? As for args4j, they offer a jar file which is in commons-cli-1.2-bin.tar.gz on the download-page. I have not found a single, complete and working usage example. Is there a good command line argument parser for Java? - A lot of other command line parsers are mentioned for Java.